We’re excited to announce that Zoetrope will premiere to a live performance of the score by Alarm Will Sound as part of the SONiC music festival! October 22 at Merkin Concert Hall. 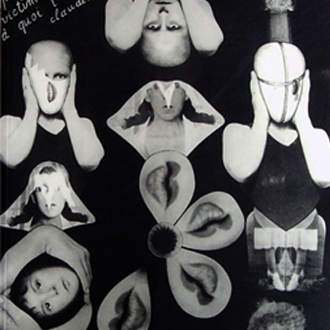 Zoetrope is a short film inspired by the work of the Surrealist writer, photographer, and activist Claude Cahun (1894 - 1954). Like the song, the film is haunting and disconcerting. But it’s also a celebration of a fearless, avant garde artist and her enduring influence. The film draws on the life and work of Claude Cahun (neé Lucy Schwob), author of Aveux non avenus and a groundbreaking visual artist. Along with her lover, Suzanne Malherbe, she made a series of photograph self-portraits, using make-up and costumes to transform herself into a weightlifter, the devil, a buddha, and other personae. In the film, several of these characters come to life inside a spinning zoetrope. In another segment of the film, Casey Legler wrestles to assemble an enormous collage inspired by several of Cahun’s collages. Max Freeman & Margaret Singer are a filmmaking duo based in Brooklyn. They are in post-production on their short film, Zoetrope, and are the creators of a popular web series, The 3 Bits. * November 2014: We are very pleased to be the recipient of a grant from WIF!